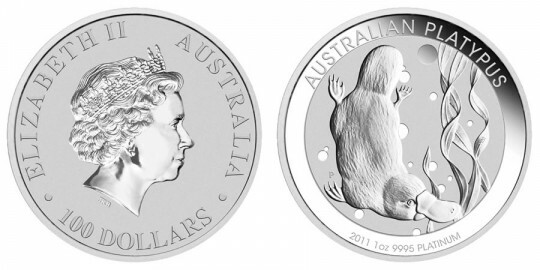 The Australian Platypus Platinum Bullion Coin debuted from the Perth Mint of Australia on March 1, 2011 as its only platinum bullion coin offering. This strike joined gold and silver bullion coins that were already offered by the Perth including the Koala Silver Coin and the Kangaroo Gold Coin. However, the Perth is no stranger to platinum products. It has offered many numismatic platinum releases over the years, and at one time even offered the Koala series in a bullion variety. Each Platypus Platinum Coin is struck from one ounce of 99.95% pure platinum. The Perth indicates a maximum annual mintage of 30,000. Struck as legal tender of Australia, the obverse contain's Ian Rank-Broadley's effigy of Queen Elizabeth II of England. She is surrounded by the inscriptions of "ELIZABETH II," "AUSTRALIA" and "100 DOLLARS." The reverse of the Platypus Platinum Bullion Coin shows an image of the web-footed mammal surrounded by the inscriptions of "AUSTRALIAN PLATYPUS," "1 oz 9995 PLATINUM" and the year of striking. Also shown is the Perth Mint's historic P mintmark.